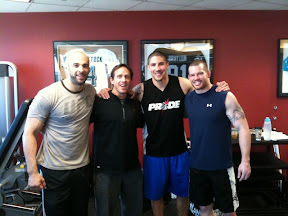 @BrendanSchaub, @FireMarshallUFC, Loren and me at Steadman Hawkins. Today Rashad was at sparring for the start of his camp here in Denver. He's looking good. Now I have to drive through rush hour traffic. It'll take over an hour for a 30 minute drive!